Delicious pasta with a lean ground turkey marinara sauce. 1. 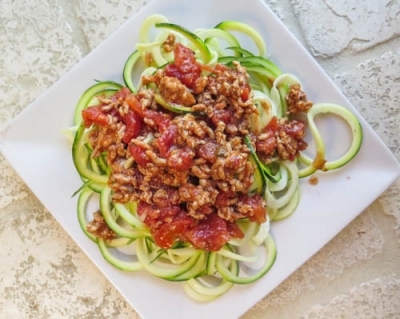 Wash and clean the zucchini's, place into spiralizer and turn until all are long noodles. Place aside. 2. SautÃ© ground turkey, onion, and garlic in the olive oil over medium heat in a medium size skillet until turkey is fully cooked. 3. Pour in marinara sauce and crushed tomatoes. SautÃ© for three minutes. 4. Place the zucchini noodles in the sauce and sautÃ© for only 2-3 minutes so noodles are slightly cooked. Enjoy with freshly grated Parmesan cheese and oregano.